The viruses that cause colds and flu are spread from person-to-person, making them very easy to contract. That is why it is important to have a strong immune system. “By taking a few simple preventative measures, you can help build immunity to a variety of cold and flu viruses,” says Verena Van Fleet, PhD, associate professor at Northwestern Health Sciences University. Exercise Consistently: Moderate exercise keeps blood and energy flowing, which increases circulation and function. “Don’t be sedentary during the week and then exercise hard on the weekends,” says Dr. Van Fleet. “This can damage your immune system and make you more susceptible to getting a respiratory infection.” Miller recommends trying tai chi or qi gong, which are gentle yet effective exercises. Vitamin C: Found in fruits, broccoli, and brussels sprouts. Vitamin A: Found in orange and red veggies such as carrots and greens such as kale. Also found in meat, fish, eggs, milk and other dairy products. Vitamin D: Found in egg yolk, cod liver oil and other sources of omega-3 fatty acids. Milk and other dairy products are often fortified with it. Small amounts of vitamin D are produced when you are exposed to the sun (although exposure to the sun should be in moderation). This may help explain why people tend to get sick more often during the winter (when there is less daylight and people are less likely to be outside). Reduce/Manage Stress: “Both Eastern and Western traditions recognize unresolved stress as a factor that weakens the body,” says Demeter. “Stress can be brought on by emotional upset, poor diet, lack of sleep and other environmental stressors.” Stress can be debilitating, using energy that should be directed to maintain and repair the immune system. When you are stressed, your body doesn’t have enough energy to maintain and repair your immune system. Live a Moderate Life: Don’t drink too much [alcohol] or eat too many sweets – it can have a major effect on your immune function. Try not to do anything in excess. Hydration is Key: Dehydration affects your skin and mucus membranes which are the first line of defense in preventing pathogens from entering your body. If your mucus membranes are dried out, it can create a problem. They are responsible for flushing out your system. Pathogens can easily attach to cells and get into your body. This is especially important during exercise. Wash Your Hands: Washing your hands frequently and thoroughly can help prevent you from getting sick and also keep you from spreading your germs to others when you are sick. You should always wash your hands before you eat. Are you or a loved one sick and worried you might have H1N1 Flu? During flu season this year, you might have to wait a long time in a crowded waiting room before you can see your doctor or be seen in an Emergency Room. Some people with the flu need to be seen right away. Other people can often take care of themselves at home just fine. This information may help you better understand the flu and what people like you should do. This information is only for individuals ages 18 and above. You can find additional information on flu and young adults or children at www.flu.gov. During flu season this year, you might have to wait a long time in a crowded waiting room before you can see your doctor or be seen in an Emergency Room. Some people with the flu need to be seen right away. Other people can often take care of themselves at home just fine. This information may help you better understand the flu and what people like you should do. American Indians and Alaska Natives are the only race or ethnic groups with increasing rates between 2003 and 2008. Obesity prevalence among these children continued to rise about a half percentage point each year from 2003 to 2008. In 2008, obesity prevalence was highest among American Indian or Alaska Native (21.2 percent) and Hispanic (18.5 percent) children, and lowest among white (12.6 percent), Asian or Pacific Islander (12.3 percent), and black (11.8 percent) children. The mission of the Notah Begay III Foundation is to promote the health, wellness and leadership development of Native American youth. 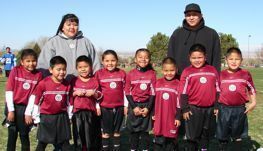 The Foundation seeks to accomplish this mission by helping Tribal Nations to build the capacity to design, manage and sustain effective wellness, sports and youth development programs for Native American youth.